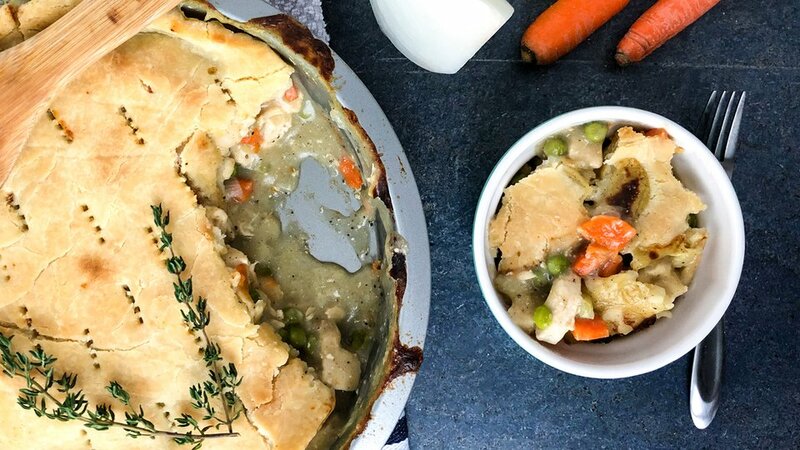 What could be more comforting than a steaming chicken pot pie with a flaky, buttery crust? Knowing your pot pie is balanced in protein, fat, and carbohydrates, and free of unnecessary additives! This lower-carb option only has crust on the top of the pie, but you definitely won't miss that bottom crust after the first bite. Melt 1 tablespoon of buttery spread in a skillet over medium heat. Cook chicken breast in skillet for 3-4 minutes until no longer pink, then add onion, carrots, and celery; cook 2-3 minutes. Add milk, broth, peas, and spices. Simmer over medium-low heat until mixture just begins to thicken. Transfer skillet contents to a lightly greased 8- or 9-inch pie pan (should fill the pan). To make the crust, add flour and salt to a large bowl. Add 1/4 cup cold buttery spread (colder butter = flakier crust), cutting in with a fork or pastry cutter until crumbly. Beat egg in a separate bowl and add 2 tablespoons of egg mixture to the dough. Add 1 tablespoon of water to remaining egg for egg wash, and set aside. Add 3 tablespoons of cold water to dough and mix just until it holds together. Dough should be neither too crumbly nor too wet. Add another tablespoon of water if needed. Roll out dough on a sheet of parchment paper to make a 9-inch circle (big enough to cover the edges of your pie pan). Pick up parchment by the ends and carefully but quickly flip pie crust on top of filling. Poke crust several times with a fork to vent steam, then brush with egg wash.
Bake in the oven for 30-35 minutes until crust is golden brown. Serve hot, or divide between meal prep containers to enjoy the rest of the week. Pie will keep in the fridge up to one week, or in the freezer up to one month.